I am starting Oracle 12c learning series, where I am planning to publish multiple articles on Oracle 12c new features. I hope these articles will be helpful to DBAs aspiring for OCP 12c certification and also others who are planning to implement these features in there databases. This is a very long post about ADO – Automatic Data Optimization, which is one of the ILM strategy to manage aging data. So please be patient while reading this article. This article provides end-to-end details about ADO implementation, commands syntax etc. Lifecycle of data starts with insert statements. New data is inserted into the table. At this stage data is either kept in non-compressed form or is compressed by DBA. But compression for such active data is optimized for DMLs (example OLTP table compression). Compression has is less and has minimal impact on DMLs. After a month, activity has subsided, although significant OLTP transactions are still carried out. At this stage, data in former most active partition stays in OLTP table compressed format and new partition is automatically created. Two months down the line data is rarely modified and accessed rarely as well. At this stage, partition can be moved to low cost storage tier and at higher compression level like hybrid columnar compression (HCC). After 1 year, data is considered dormant and is no longer accessed or updated. At this stage, data can be moved to low cost storage tier with highest level of HCC compression and may also be marked as read-only. Automatic data optimization (ADO) is an ILM strategy which uses activity tracking by using heat map to determine if the data is still getting accessed on not. These collected heat map statistics are stored in SYSAUX tablespace. These statistics provide “heat map” of hot and cold data based on how frequent the data is accessed or modified. ADO allows you to create policies that uses heat map statistics to compress and move data when necessary. ADO automatically evaluates and executes policies that perform compression and storage tiring actions. You can also create ADO policies based on different operations to track. 3) Evaluating and executing ADO policies. By default, segment level ADO policies are evaluated every day during maintenance window. DBA can also create custom schedule for evaluating ADO policies. Row level policies are evaluated by MMON every 15 mins. 4) Verify ADO execution details by using DBA_ILMEVALUATIONDETAILS and DBA_ILMRESULTS view. 5) Verify if segment is compressed or moved based on the action provided in executed policy. Above parameter will enable activity tracking for entire instance. Enabling heat map will enable tracking both DML and access at segment level and store these details in relevant table in SYSAUX tablespace. This will not track any access details of segments in SYSTEM and SYSAUX tablespace. Once you enable heap map, you can check various details of activity tracking provided by heat map. You can check details about when segments were accessed recently, was it row ID access or full scan access or when was the recent DML performed on the segment. Tracking details of segments are available at real time in V$HEAP_MAP_SEGMENT view. As soon as session accesses some objects in database, its heat map information will be available immediately in this view. If you see column FULL_SCAN is YES, it means the access was done using full scan. TRACK_TIME is the timestamp when access or modification was done. You can also see LOOKUP_SCAN column is YES for 1 row where object_name is the name of index. So if index is getting used in your select plan, it will show LOOKUP_SCAN as YES for such access. This view shows heat map information for top 100 tablespaces. It gives report at tablespace level instead of segment level. You can fine MIN, MAX and AVG read time, write time, full table access time and lookup access time for each tablespace. DBMS_HEAT_MAP packages can be used to get heat map statistics at even deeper level. The default access is only going to let you know heat map statistics at segment level. But if you want to go deeper, for example to check which blocks were accessed and at what time, you can use use subprograms in DBMS_HEAT_MAP package. Similarly, DBMS_HEAT_MAP.EXTENT_HEAT_MAP function provide heat map statistics information at extent level. Tablespace level – Default ADO policy can be defined at tablespace level and will be applicable to all the segments existing in that tablespace or new segments getting created in that tablespace. Group level – When we define group level ADO policy, if a table is eligible for specific ADO action defined in policy, the same action would be performed on all dependent objects. If action is compress and table has LOB columns, all secureFile LOBs will be compressed as well. Segment level – Applies to tables and table partitions. If no policy defined at segment level and we have a default policy at tablespace level, tablespace level policy applies to segment. But segment level policy overrides tablespace level policy. Row level – Can be created only for tracking modifications. We cannot have row level policy for creation and access operations. You can create ILM policies during CREATE TABLE statement or you can add ILM policies on existing tables using ALTER TABLE statements. A segment can have multiple ILM policies defined on it. Before we look into different example of creating ILM policies let’s take a look at various compression level available. Data can be compressed while its being inserted, updated or loaded into a table via bulk load. This is basic level of compression and is used while inserting data into a table without using direct-path insert, using advanced compression option (ACO). This a renamed syntax for the previous OLTP table compression feature that was part of ACO. ROW STORE COMPRESS ADVANCED on heap table maps to LOW compression for SecureFile LOB segments when GROUP level ADO policy is implemented. This provides Hybrid columnar compression (or HCC) and provides higher level compression then ROW STORE COMPRESS. It works well when load performance is critical and frequent queries are run against the data and no DMLs are expected. COLUMN STORE COMPRESS FOR QUERY LOW or HIGH maps to MEDIUM compression for SecureFile LOB segments when GROUP level ADO policy is implemented. This provides Hybrid columnar compression (or HCC) and provides highest level of compression. It works well when data is accessed very infrequently and no DMLs are run against data. COLUMN STORE COMPRESS FOR ARCHIVE LOW or HIGH maps to MEDIUM compression for SecureFile LOB segments when GROUP level ADO policy is implemented. In the above colorful command, we can see various sections required in policy implementation. TABLESPACE in purple color tells that this is the default policy at tablespace level and applicable to segments in that tablespace as represented by SEGMENT keyword in blue. SEGMENT – This represent that this policy is applicable to all segments in USERS tablespace. AFTER 30 DAYS OF – This represent condition when this policy will be eligible to take required action of compression. In the above example, we are implementing group level ILM policy. This policy will automatically compress the table SALES if no modification is done for 60 days. Since we are using GROUP level policy, dependent LOBs are compressed with LOW compression after 60 days of no modification. In this example, we are creating segment level compression policy on SALES table. This policy is going to automatically compress SALES table with COLUMN STORE COMPRESS FOR QUERY HIGH if it’s not modified for 90 days. Above policy will compress any block of the table SALES whose all rows are not modified from last 30 days. Even if 1 row in a block gets modified, it does not qualify for compression. Important thing to note here is that row level compression polices can be created based on modification time only. They cannot be created based on creation time or access time. Also, only compression type available for row level compression policy is ROW STORE COMPRESS ADVANCED/BASIC. We cannot use columnar compression for row level policy. This is another type of ADO policies that we can set at segment level only. We cannot set this at tablespace level or group level or any other level. Also, data movement happens at tablespace level. Meaning that we can move the table or partition to another tablespace based on low cost storage. TIER TO is a new clause and we specify which tablespace the segment should move if it satisfies he condition set. We can also provide custom ILM rules in the last section of the command instead of providing condition (example AFTER 30 DAYS, AFTER 1 YEAR etc) and operation (example CREATION, NO MODIFICATION, NO ACCESS etc). In the above example, we replaced compression clause with “TIER TO” clause. TIER TO – This clause provides tablespace name where segment should move after it satisfies the condition. In this example, ILM policy will automatically move SALES table to low_cost_storage tablespace after 60 days of creation. If we don’t provide the last part of condition and operation, then policy will be created and data movement action will take place when tablespace is running out of space. Space threshold for tablespace is already set and we can see those values in DBA_ILMPARAMETERS table. TBS PERCENT FREE (default 25): Objects with tiring policy will continue to move out until source tablespace has TBS PERCENT FREE space (default 25% free). You can see current values set by querying DBA_ILMPARAMETERS view. You can customize following parameters using DBMS_ILM_ADMIN package. We will check out other procedures and functions in DBMS_ILM_ADMIN package at later section in this chapter. Also, if we set this policy on many tables in the same tablespace and if tablespace reaches the fullness threshold, then tables will be moved to different tablespace in the order of oldest accessed tables first. Last thing to know about data movement policy is that they are executed only once in life time. Since they apply only at segment level, once the policy is executed on the segment and required movement takes place, the policy is disabled for that segment. This rule applies only for data movement policy and not for compression policy. A custom ILM rule should be a function which returns Boolean. You can implement complex logic inside the function and return Boolean after evaluating that complex logic. If return value is true, ILM policy takes action. If return value is false, ILM policy does not take action. This custom ILM rule can be used for both compression action as well as data movement action policies. A segment can have multiple ADO policies implemented on this. This logically makes sense as we want to have different action taken on data as it ages more and more. Example, we might go for basic level of compression after 1 week of data insertion, more advanced compression after a month of no creation or no modification and highest level of compression of moving to low cost storage after a month of no access or after a year of creation of data. So satisfy all these timelines and criteria it’s not unusual to have multiple ILM policies on a segment. But there are rules to follow. If you create a segment level policy on a table based on ACCESS, make sure that other policies are also created based on ACCESS operation only. Also remember that you can create only “no modification” operation policy at row level. As we discussed before, we can create policies at tablespace level, which serves as default policy for every segment created in that tablespace with no policy, segment level and even at partition level. Question remains as to which policy will actually take affect? We can check different policies implemented on different objects using DBA_ILMOBJECTS view. Similarly, policy P25 applied to table and all its partition. But we create policy at table level only and not at partition level so all partitions of table inherit table level policy. For object type TABLE and policy P25, we see “POLICY NO INHERITED” in INHERITED_FROM column. This is because we have created new policy at table level and it’s not getting inherited from any level. We have couple of views to provide details about ILM policies that exists at various levels in database. Even compression policies are represented as data movement policies in this table. This is because during compression data movement happens. Row level policies are evaluated and executed every 15 mins by MMON background process. Segment level policies are evaluated and executed daily once during maintenance window using a scheduler job. This scheduler job uses DBMS_ILM.EXECUTE_ILM_TASK procedure to evaluate and execute ADO policies. ** Note that name of the package is DBMS_ILM as against DBMS_ILM_ADMIN, which is used for customizing ILM parameters and other admin related tasks. 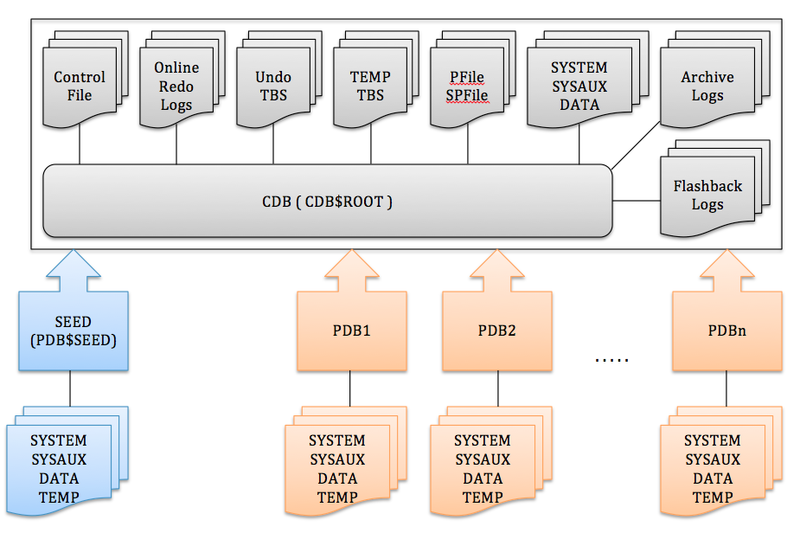 We will look into DBMS_ILM_ADMIN package in short while. In DBMS_ILM.EXECUTE_ILM_TASK procedure, TASK_ID is an input parameter which is automatically generated during evaluation process, which also happens during scheduled maintenance window. You can change the interval of evaluation and execution using DBMS_ILM_ADMIN.CUSTOMIZE_ILM procedure. We have seen this procedure previously when we were changing TBS PERCENT FREE and TBS PERCENT USED parameters. We can use same procedure to customize execution interval of ILM tasks. You can directly execute ADO policies without doing any customization using DBMS_ILM.EXECUTE_ILM procedure. Note that this procedure is different than the one that runs in scheduled maintenance window (DBMS_ILM.EXECUTE_ILM_TASK). There are multiple definitions of this procedure and in simple definition, you can just pass owner and table name and all policies on that table will be executed. Add/remove objects/subobjects from ILM tasks evaluation result. let’s say above command generated task_id as 1234. EXECUTION_MODE: ILM_EXECUTION_ONLINE value executes the task online and ILM_EXECUTION_OFFLINE executes the task offline. This view can be used to see details on task execution after the evaluation of the ADO policies is completed. If the SELECTED_FOR_EXECUTION column in this view has the value “selected for execution,” then the policy has been selected for execution indeed and an ADO job will be executed to satisfy the ILM policy. However, a job may not execute if there’s a value other than “selected for execution” under the column SELECTED_FOR_EXECUTION. You can enable and or disable ADO policies at individual table level or at database level completely. You can disable ILM completely in database using DBMS_ILM_ADMIN.DISABLE_ILM procedure. This disables ILM, but keep all policies intact. Those policies will not get executed until we enable ILM.